A complete step by step tutorial on How to do Interfacing of Keypad with 8051 Microcontroller in Proteus. Hello friends, in today’s post we are gonna have a look at Interfacing of Keypad with 8051 Microcontroller in Proteus ISIS. 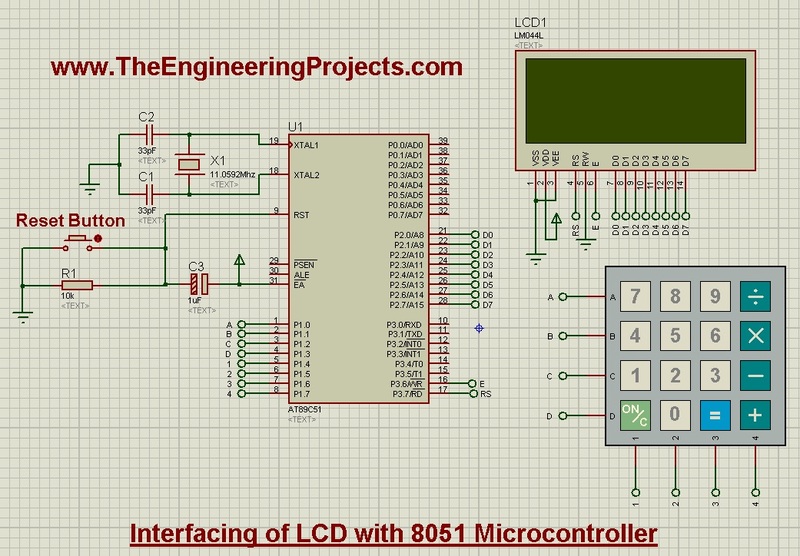 In the previous project, we have seen the Interfacing of LCD with 8051 Microcontroller and I have told there that LCD is a great debugging tool as we can print our data on it and can display different values and that’s what is gonna done in today’s post. Today, I will get the values from keypad and then question is how to know that we are getting the correct values. So in order to do so, we will display these values over LCD. So, that’s how we are gonna use LCD as a debugging tool. 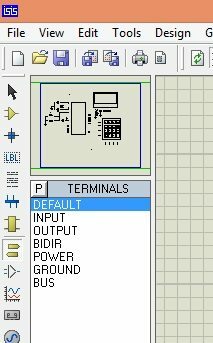 As the debugging is concerned, there’s another great tool for debugging which is called Serial port, we can also display these values over to Serial port. So, you should also read Serial communication with 8051 Microcontroller in Proteus ISIS, and try to display these keypad characters over to Serial port as a homework. Anyways, let’s come back to keypad, if you wanna read the keypad details then you should read Interfacing of keypad with Arduino in Proteus ISIS as I have mentioned all the basic details about keypad in that tutorial and I am not gonna repeat it. But as a simple recall, keypad works on matrix system like it has 4 columns and 4 rows so we will have total 8 pins through which we are gonna control these 16 buttons. So, let’s get started with it. Keypad is quite an easy and basic tool in embedded projects which is used in almost every kind of engineering project. Today, we will first design the Proteus Simulation and after that we will design the programming code for 8051 Microcontroller. The 8051 Microcontroller I have used is AT89C51 while the compiler I used for this microcontroller is keil uvision 3 and the simulation is designed in Proteus ISIS. Get the below components from Proteus components library and place it in your workspace. Now as you can see in the above figure, I have used 4×4 keypad which has 4 rows and 4 columns and that’s why there are total 16 buttons on it. So, I have connected 8 pins of keypad with Port 1 of 8051 microcontroller. LCD data pins are connected with Port 2 while the RS and E pins are connected to Port 3. 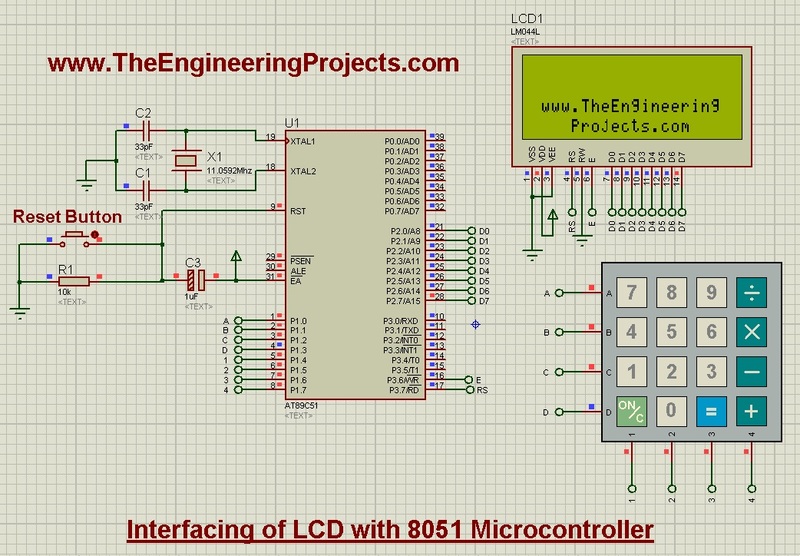 So, now let’s move to the programming code for Interfacing of keypad with 8051 Microcontroller. For programming purposes I have used Keil uvision 3 Compiler. 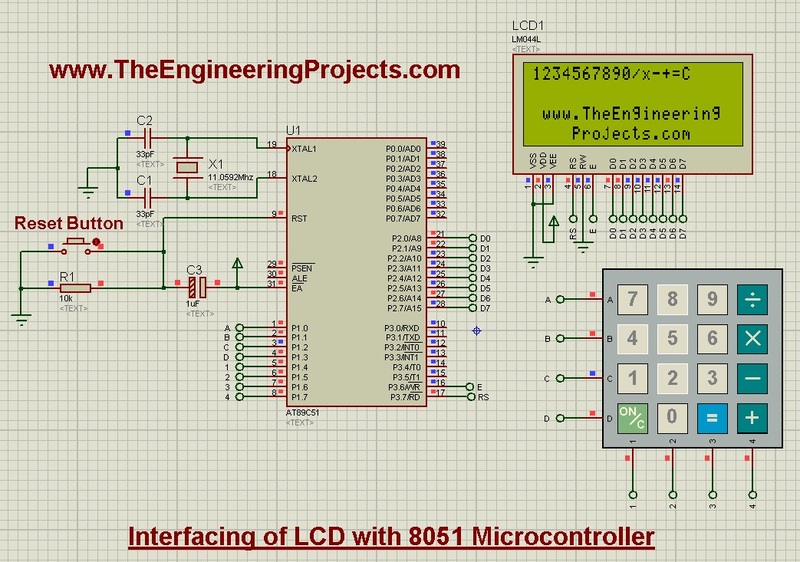 Most of the code is quite similar to that for Interfacing of LCD with 8051 Microcontroller, so if you wanna read about that then read this post. In the above function, which is READ_SWITCHES(), what we are doing is we are first checking the rows and after that for each row we are checking the columns. For example, if you have pressed the button “1” then it will detect that first ROW and the first COLUMN has gone LOW and it will print out 1 as shown in above code. That’s how its reading all the 16 buttons, first detecting the Rows and then for each row detecting all the columns and then printing out the respective character. So, now upload this code to your keil and get the hex file. Upload this hex file to your Proteus software and run the simulation. Obviously our website link at the bottom, now when you press the buttons on Keypad then it will start displaying on the first row of LCD. Now you can see the keypad buttons are displayed on the LCD. Now you can download the Proteus Simulation along with hex file and code by clicking the below button. Could you please make this circuit with 7SEG*4 display?